On July 17, Will Weaver was named as the second-ever head coach of the Long Island Nets, chosen to succeed inaugural coach Ronald Nored. Weaver had spent 2016-17 and 2017-18 as a special assistant to Brooklyn Nets head coach Kenny Atkinson, and his service in that role was highlighted by Long Island Nets GM Trajan Langdon in making the move and announcement. "We are thrilled to welcome Will as the new head coach of the Long Island Nets," Langdon said in a team release. 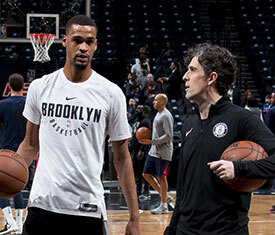 "Will's experience working under Kenny Atkinson on Brooklyn's coaching staff has given him a strong foundation to lead Long Island, and we are confident that his vision and focus on player development are the right fit for the team and its young talent." The Long Island Nets kicked off their 2018-19 season with a win over the Westchester Knicks on Saturday night, and as they get ready Thursday night for the first of six games to be televised on YES, we break out the Nets Quotebook, this time with five members of the 2018-19 Brooklyn Nets dishing on what it was like to play under Weaver. JARRETT ALLEN: "Will's a former Longhorn just like me, and he's a good guy. He's always smiling and trying to get people pumped up, and he just helped me get accustomed to the NBA. When I first came in, he had his hat on, his Longhorn hat, and he was just introducing me to everybody, and came in and just showed me around. You can see he has some of Kenny's style of coaching in him, and I think he's going to do really well (with the Long Island Nets)." SPENCER DINWIDDIE: "Weave was one of my small group coaches, and he helped out a lot with everything I was doing -- obviously just picking spots on the court, and looking at different options, looking at the game from different perspectives We grew to have a nice relationship and to be able to have him still in the family is huge. He's one of the smartest guys on the coaching staff, and analytics is one of his specialties. He's just a great basketball mind to have and to be able to bounce ideas off of." JOE HARRIS: "Will was great. He was the Einstein, the brains behind our analytics, and I feel like he's very good in explaining that end of the game so everybody understands. He was instrumental for us in terms of everybody's development in that area, and getting us thinking about the game with a different perspective. Just from the moment that I got here, his role was kind of explained as doing different situational stuff with us, so we would go over different things, like how important it is to win a jump-ball in overtime, because chances of winning increase dramatically when you win the tip. Things like that, Will brought a different perspective that you wouldn't otherwise think of, and had tidbits here and there that he would plant in each of us. He was really helpful to a lot of us, and we're disappointed to see him go, but I think he's going to do really well with the young guys in Long Island." RONDAE HOLLIS-JEFFERSON: "He's a very intelligent man, his knowledge for the game and IQ is tremendous. We talk a lot, you know, just about the intangibles, and the smarts and the IQ of the game, and he knows a lot. He definitely helped me grow and see things in different ways. He definitely knows more than a lot of people." CARIS LEVERT: "Will is a very detailed guy. I remember his scouting reports were always very, very in-depth and very detailed, and if you ask a question, he has the answer right away. He's a good skills development guy as well, you know. I did a workout with him one time, all left-handed, and I was pretty exhausted afterwards, probably more mentally than physically. But he's very big into the details and I've always respected him for that. I'm very happy for him, getting the head job with the Long Island Nets."